Smaller cap stocks were under greater pressure than their blue-chip counterparts during the last review although this shouldn’t come as any great surprise. During times of increased volatility (like that seen over the past few months) there is a flight to safety which automatically puts more pressure on the minnows. In fact, the Small Ordinaries (XSO) declined by over 19% off the highs made in August last year, with the ASX200 (XJO) retracing 15%. Perhaps not overly significant although the underperformance held true during the initial stages of the subsequent rally. The XJO has already headed into the typical retracement zone, with the XSO still having plenty of work to do before hitting that target area. On the flipside of course, when the Bulls are in full control and confidence levels are high we can flip those statistics on their head. Confidence is undoubtedly returning which has helped the smaller cap stocks over the past few weeks although the big question remains as to whether the current resurgence is capable of continuing. Nothing is impossible although as we’ve been saying over the past few weeks, at this stage we are looking for a rally only and not a resumption of the longer-term uptrend off the 2009 lows. There is still reason to be cautious, at least until some milestones (which we’ll discuss below) can be overcome. → Increased fears that the global economy is about to slow down. → Volatility continues to remain elevated. → A corrective pattern lower appears to be in motion. → The “risk on” approach has waned. → Perceived headwinds in China not helping sentiment. → A possible trade war is still feasible. → During times of uncertainty defensive stocks become more popular. Although we were looking for price to head down into the typical retracement zone during our last review we also wanted to see a bounce, as price action was looking strong and impulsive to the downside. 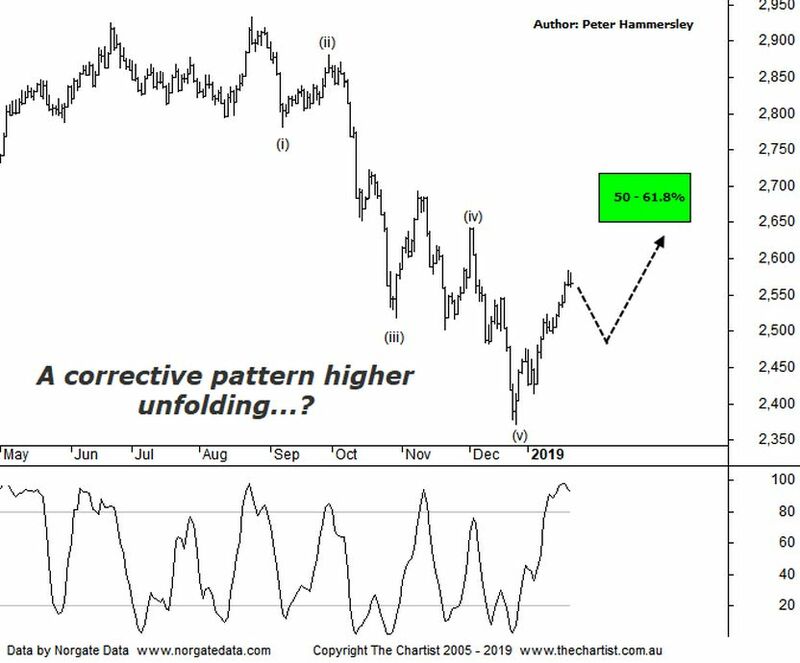 Although a short rally ensued, it hasn’t been enough to suggest the retracement over the past few months is the full extent of the corrective pattern which would have been ideal. Indeed, our target area has already been tagged and rejected although it subdivides into a 5-wave move which is the same situation with the XJO. From an Elliott stance this should be followed by choppy and overlapping price action which is clearly not the case. This opens the door for something more bullish to unfold although the patterns still need to prove themselves before we are convinced. At this juncture, as strong as the rally has been, we are still looking for a bounce only and nothing more. As mentioned above, there is still work to be done before heading into the 50% – 61.8% retracement zone on this chart. It would take a push above the upper boundary of the target at 2716 before looking for an alternate count. This weekly chart reiterates the fact that the corrective pattern down lacks symmetry in terms of time. In fact, we don’t even have to make any time projections as it’s clear that the pull-back hasn’t taken anywhere near the minimum required 38.2% of the time taken by the prior trend. All we can do for now is see how price enters the target area and whether it is a corrective or impulsive pattern. This will be the big clue as to what unfolds next. It hasn’t been a deliberate act not to be involved with the minnows although without bullish patterns there’s simply been no reason to push trades just for the sake of it. A low-volume retracement over the next week or two, or even a sideways consolidation could present opportunities although for now setups are conspicuous by their absence. As mentioned above, the patterns on this chart have taken a turn for the better although it’s still early days.